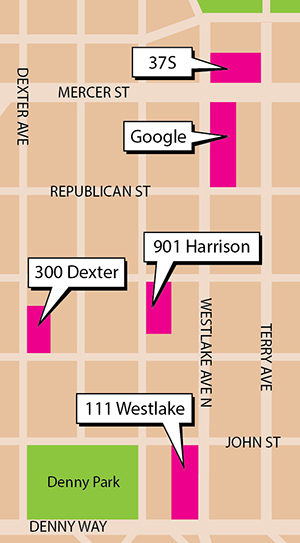 Seattle DJC.com local business news and data - Real Estate - On the Block: Vulcan and ZGF ready 300 Dexter, but with Amazon done growing in SLU, who will lease it? On the Block: Vulcan and ZGF ready 300 Dexter, but with Amazon done growing in SLU, who will lease it? Three years ago, in a very different market, Vulcan Real Estate paid almost $30 million for the corner property at 300 Dexter Ave. N., aka Block 57W. Back then, it seemed that Vulcan's favorite tenant, Amazon, had an unlimited appetite for space in South Lake Union. What a difference three years can make. Since then, Amazon bullied the Seattle City Council over its enacted and swiftly rescinded head tax to alleviate homelessness. 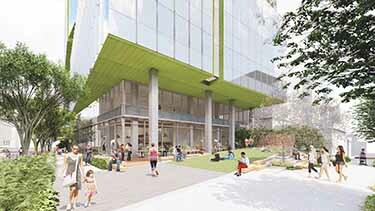 It briefly paused a Denny Triangle tower — on land it owns — and finally pulled out of its Rainier Square lease. Retail is concentrated in two bays to the south, on the corner of Thomas Street, facing a public plaza.